You can tell a lot about a society by its taboos. Several weeks ago, America reeled when Adrian Peterson—the great NFL running back of his generation—was indicted on charges of “reckless or negligent injury to a child.” Peterson is alleged to have disciplined his son by “whooping” him—these are Peterson’s words, not mine—with a “switch.” The child, a 4-year-old boy, suffered cuts on his backside and thighs. For this act, which 50 years ago was commonplace, Peterson was arrested, suspended by his employer (the Minnesota Vikings), and publicly castigated by all and sundry. Unremarked upon was the fact that the 29-year-old Peterson does not live with this boy and reportedly has seven children—that we currently know about—with five different women. Which illustrates nicely the changing mores in America: Corporal punishment is a scandal, or even a crime, but there is no judgment about men who father children out of wedlock and then abandon the vulnerable mothers and children. Yet only one of these pathologies poses an existential threat to our society. This problem, which scientists refer to as “family fragmentation,” is the subject of Mitch Pearlstein’s new book. The book is Broken Bonds: What Family Fragmentation Means for America’s Future, by Mitch Pearlstein. What amazes me about the discussion of family breakdown is how difficult it is for liberals/progressives to acknowledge that family fragmentation actually is a problem. I remember back a few years ago when there was another brutal murder in Chicago, mob violence caught on camera. People in the city demanded something be done, and of course politicians had to speak up. The Obama administration sent U.S. Secretary of Education Arne Duncan. He gave a talk, and what stood out to me is that he never once mentioned the importance of the family, intact, mom and dad, married, for curbing violence. This is a powerful ideological blind spot liberals have a very hard time with, no matter how much evidence proves that family breakdown kills. Literally. This animosity toward what is called the nuclear or traditional family goes back a long way on the left. Post-Enlightenment Intellectuals who were slowly abandoning God and religion increasingly saw the family in a negative light, a patriarchal institution meant to keep women down and inhibit freedom and self-fulfillment. As we got to the 1950s and ’60s and the good old Sexual Revolution, the family was often portrayed as downright evil. 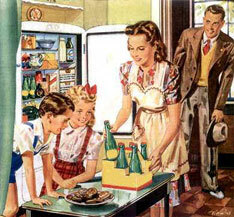 Popular culture did its best to paint mom, dad, married, with kids as a jail people needed to break out from. But something happened on the way to the self-fulfillment utopia: getting rid of the family had consequences, bad ones. The cultural elite mocked Dan Quayle in the early ’90s when he said that the fictional TV character Murphy Brown having a child out of wedlock was a bad thing for society. Then, by golly, as the social science evidence began to pile up, The Atlantic magazine later ran a cover story, in April 1993, that said, well, after all, Dan Quayle was right! Twenty years later, The Washington Post chimed in to state that Vice President Quayle’s initial analysis was more right than ever. These and other mainstream liberal publications have had no choice but to admit that family fragmentation is a bad thing, but they still suggest that maybe it’s not all that bad. Sure, the family, mom, dad, married, with kids, is a good thing, but hey, a “modern family” can work too! And it’s not nice to make those other, non-ideal families feel bad. They can’t help it! Right now in American history, the left has an uneasy ambivalence about the family, but the vast majority of them, especially those in positions of powerful culture influence, can in no way get themselves to admit that the traditional family is the gold standard, that it’s something that people should aspire to. I’m afraid they are a long way from that. As one black leader put it ruefully, how can you speak out against fatherlessness without calling half your audience bastards?